Joe, meet Jane. Mary Jane. A smart new product line developed by Cannabiniers delivers cannabis-infused coffee and tea in single-brew, sustainable pods called Brewbudz. “We are establishing a new beverage category—a cannabis beverage that is socially accepted,” says Jeffry Paul, vice president of California-based Cannabiniers. 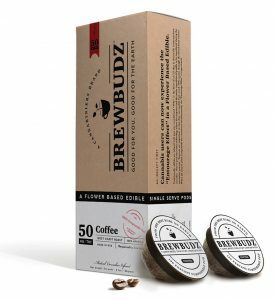 While coffee and cannabis are no strangers—brands such as Catapult and Legal commercialized the elixir in 2014— Brewbudz offers the first compostable, flower-based product. The eco-friendly pods fit into Keurig dispensers and other similar devices. Brewbudz roasts responsibly sourced whole Arabica beans for its West Coast Dark blend, giving imbibers some ethical contentment and a full-bodied cup of joe. French vanilla and hazelnut flavors will soon join the West Coast line in addition to black and chamomile teas and hot cocoa, the latter described as a dessert beverage. Pods contain one of two cannabis strains, depending on the beverage. Coffee and black tea pods infuse sativa, uplifting and complimentary to caffeine. Decaffeinated coffee and chamomile- eucalyptus tea pods feature indica, which helps users relax and decompress. Pods range from 10 to 50 mg of THC, with higher doses aimed at medicinal users and lower doses geared toward recreational use. Brewbudz retails for about $7 a pod, depending on the dispensary, and is sold in packs of three. Cannabiniers hopes to introduce the compostable pot pods beyond California to 18 states over the next 18 months.